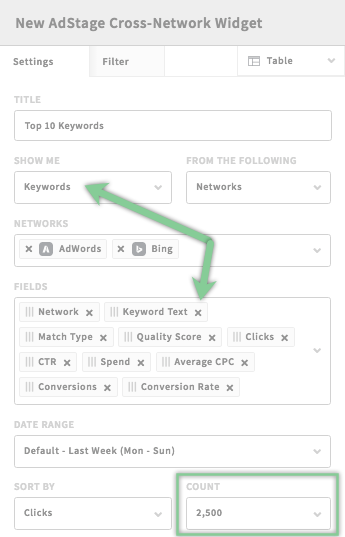 Reporting at the keyword level allows for more granular insight to keyword performance. It helps you to easily uncover the keywords generating the most impressions, clicks and conversions to help you focus on optimizing those campaigns, ad groups, or ads. Building a keyword level report widget follows the same process as any other reporting widget in AdStage. Simply select the widget you'd like to build, and make sure you select Keywords in the "Show Me" drop-down section. Note: Keyword-level reporting is only available for Google Adwords and Bing Ads. What are some common ways to use keyword-level reports? Monitor your Quality Score: Keep and eye on keywords that are generating a ton of sales at a low cost, but might also have high impressions and a low CTR. Over time, these high impressions and low CTR could drag down your quality score and become increasingly expensive. Trend Comparisons: easily compare total conversion to cost per conversion trends in your advertising. Budget Efficiency: quickly identify drastic CTR or cost changes to any of your keywords. How do I add keywords to my reports? Step 3: Optional: add Quality Score, Match Type, Keyword Text, and Average Position in the 'Fields' field. Use Automated Alerts to monitor any drastic changes to keyword performance with performance-based triggered email notifications.